For years, scientists who study the shoreline have wondered at the apparent fickleness of storms, which can devastate one part of a coastline, yet leave an adjacent part untouched. One beach may wash away, with houses tumbling into the sea, while a nearby beach weathers a storm without a scratch. How can this be? understand when conditions are right for a beach to erode or build up. Understanding beaches and the adjacent nearshore ocean is critical because nearly half of the U.S. population lives within a day’s drive of a coast. Shoreline recreation is also a significant part of the economy of many states. For more than a decade, I have been working with WHOI Senior Scientist Steve Elgar and colleagues across the country to decipher patterns and processes in this environment. Most of our work takes place in the breaking waves of the surf and swash zones: the region that begins where waves crest and ends where the foamy white water barely covers our feet. Our goal is to understand and model waves, currents, and sand movement in the nearshore. Given weather conditions (winds, offshore waves), a map (islands, canyons, shoals, sandbars, the slope of the beach face), and sediment characteristics, we want to be able to model and predict how waves might change, and how those changes might affect currents and the erosion or accretion of sand on the beaches. To do this, we have to get into the water, making observations in the middle of the breaking surf. If we are successful, we can help coastal policymakers and managers understand how the movement of water affects the evolution of coastlines, the safety of beachgoers, and the dispersal of runoff and pollutants. As storms and winds churn the ocean, waves roll across the continental shelf and into shallow water near the shore. They pitch forward and break, spraying foam and running up onto the beach. As the waves break, they drive currents that flow both offshore and along the coast. Such is the surficial view that most of us get when we stand on the shore. But what lies beneath the waves can make all the difference between 20-foot breakers and gently lapping rollers. As waves move from deep water toward the shoreline, the ocean bottom alters their direction and strength, just as a lens bends and reflects rays of light. Features such as submarine ridges, canyons, and sandbars influence the propagation of waves, just as winds are directed and focused by mountains and valleys. Waves and currents affect this movement of sediment, but changes in sediment levels, in turn, affect the waves and currents. For example, sand eroded from the beach during winter storms may move offshore to form a sandbar. That causes waves to break farther offshore, protecting the beach from further erosion. To avoid the complicated physics associated with along-coast changes in wave height and direction, most scientific studies of the nearshore have historically been conducted on smoothly sloping beaches with long, straight shorelines. The relatively simple shores of the Outer Banks of North Carolina have been a frequent focus for nearshore research. It was assumed that waves, currents, and sand levels were uniform up and down these beaches. 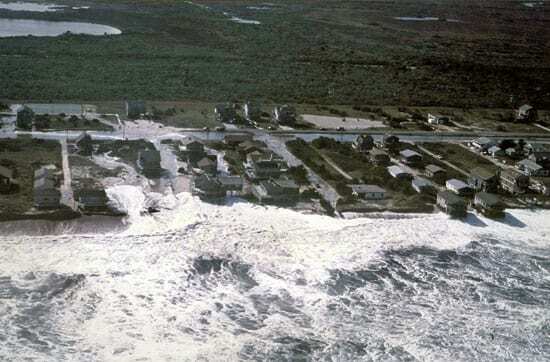 However, recent studies by Jeff List of the U.S. Geological Survey have shown that even on these long, straight coastlines, one section of beach may recede shoreward by tens of yards during a storm, while a few miles down the coast the beach may be unaltered. Most of the eroded sand eventually returns after the storm, but that is no consolation to the owners of homes and structures destroyed by the shifting shoreline. Several hypotheses explain the divergent erosion rates along the same coast. Perhaps there are differences in the underlying geology of the region or in the flow of groundwater to the ocean. Maybe something as subtle as the size of sand grains makes a difference. Or perhaps these seemingly “simple” and similar seafloors produce more changes in offshore waves than we think. My research group is intrigued by a different theory: the location of underwater sandbars in the surf may cause variable erosion along the coast. Sandbars appear to protect beaches by causing increased breaking and dissipation of wave energy before the waves can attack the shoreline. To test the sandbar hypothesis we used observations of waves and mean water levels collected at the Army Corps of Engineers’ Field Research Facility in Duck, N.C. We found that sandbars affect the coastal water levels and flooding during storms. When a sandbar is near the beach, waves break in shallow water and drive more water onto the shore. This causes flooding and allows the surf to reach dunes and manmade structures. We believe that shallow sandbars may lead to increased erosion. Sandbar locations can be variable along straight coasts, which may explain Jeff List’s findings. And recent aerial observations collected by Tom Lippmann of Ohio State University show that the numbers and locations of sandbars influence a storm’s effect on a beach. But further research is needed to determine whether the feedback between sandbars and coastal water levels is important during storms. In contrast to much of the East Coast of the United States, many continental shelves have abrupt, irregular changes in the seafloor that cause large changes in the waves beyond the surf zone. For instance, the steep topography of Scripps and La Jolla submarine canyons in Southern California produces dramatic changes in wave energy over distances of a few hundred meters. As waves pass over the canyons, the seafloor acts like a magnifying glass, concentrating ocean wave energy into hot spots. This makes Black’s Beach a world-famous surf spot, whereas La Jolla Shores (just two miles to the south) is well known to novice sea kayakers and scuba divers for its gentle waves. These changes in wave heights along the coast result in complex flows of water and changes to sand levels on the beach. Water that piles up on the shore near the large breaking waves at Black’s Beach tends to flow south toward La Jolla Shores and north toward Del Mar. When these currents intersect with opposing currents—perhaps between the heads of the two canyons—strong offshore-directed flows, called rip currents, can form. Rip currents are a danger to swimmers and have been observed to carry huge plumes of sand and pollutants offshore. Scientists from WHOI and 10 other institutions recently conducted a major field program in those complicated Southern California waters to determine how abrupt coastal-seafloor topography affects waves, currents, and changes to sand levels. The team of more than three dozen scientists, engineers, students, and research assistants deployed instruments to measure the effect of the canyons on waves, and the resulting changes in the flows onshore. In the Nearshore Canyon Experiment (NCEX), sponsored by the Office of Naval Research and the National Science Foundation, my colleagues and I deployed pressure gauges and current meters in the surf and swash zones to measure wave heights and directions, and the resulting movement of water and sand. “Drifters” designed to operate in the breaking waves of the surf zone were used to determine the locations and speeds of rip currents. Beach surveys were conducted frequently to see how the seafloor and sand levels evolved under changing surf conditions. Other scientists bounced radar signals off the water surface to determine its speed, just as police use radar guns to track moving cars. Video cameras chronicled sea foam as it was carried along the coast by the complex currents. We have only begun to analyze our observations, but eventually we will be able to update and improve numerical models of the important physical processes, and to test the model predictions with real-world measurements. Our long-term goal is to predict coastal wave heights and directions, nearshore currents, and changes to beach sand levels. We may not achieve this goal until we can study nearshore processes on a wide range of coasts (for instance, rocky shorelines, peninsulas, and large bays), but it is achievable within our lifetime. Surfers, sport-fishermen, and recreational boaters frequently use predictions of wave heights along the coast of Southern California, as generated by our colleagues from the Scripps Institution of Oceanography. The new NCEX measurements will improve the prediction models, helping not only those who play at the beach for the day, but also civic leaders who must manage our beaches and coasts for the long term. One hundred years ago, we could not predict whether it would be sunny or rainy the day after tomorrow. Now we can predict the weather as much as 10 days in advance. By the middle of the 21st century, we ought to be able to predict the weather at the beach…both above and below the water line. Breaking Waves and Shifting Sands: "The Science of Surf"
Field Research Facility in Duck, N.C.